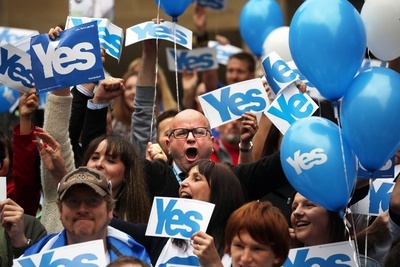 A primer on the key issues Scots are weighing at the ballots today. Today marks a potential, but unlikely, new chapter in Scotland's history. People 16 years of age and older living in Scotland will decide whether the north should go it alone or continue 300 years of somewhat happy unity with the rest of the U.K. Given the demographics of our readership, there's approximately a 98 percent chance that you're not eligible to vote in today's big referendum. Still! As a politically engaged global citizen you will likely talk about it with your co-workers and peers, weighing your own country's historical struggle to become independent from the United Kingdom with the economic realities of a Scotland-U.K. split. To help you with those conversations, we've compiled a list of key issues Scots (as well as the multitude of non-Scots living in Scotland and therefore eligible to vote) should consider, and you should mention to sound well-informed. The Basics: It's estimated that about 84 to 90 percent of the oil in the North Sea belongs to Scotland. Scottish First Minister Alex Salmond has said that the wealth from that oil would go into a fund that would pay for social welfare programs and schools. And for a while, that would work. But reports also show that the North Sea's oil reserves are getting tapped out. Wood Mackenzie, an oil and wood consultancy firm, estimated that production (and revenue) would decline by 2018. At the same time, Scotland has other industries, including whisky, tourism and textiles. Banking would be part of the list, but several banks have hinted that they'd bail on an independent Scotland. If you agree that it is Scotland's oil, and think the country will bounce back when its oil reserves eventually run low, then you should support independence. If you think that betting the future of your economy on oil reserves that will eventually run dry is a bad idea (in this case, it is a bad idea) then you should not support independence. The Basics: Scotland is more liberal than the rest of England, and wants to drastically change its welfare system. Scottish nationalists have promised to raise the Carer's Allowance (for people who spend 35 hours a week caring for someone), raise the minimum wage and enact several other changes. As Scotland's housing minister Margaret Burgess put it, "Scotland is an enormously wealthy country, but for far too many people it simply does not feel like it." The Better Together campaign released a report arguing that the proposed social welfare reforms would be too expensive. A less biased panel established by the Scottish government found that it might take until 2020 for Scotland to separate its welfare system from the rest of the United Kingdom, as a faster separation might disrupt payments to people. Also worth noting: Scotland has received more benefits than it paid in taxes over the last generation. If you are convinced that Scotland will be able to afford the reforms (even when North Sea oil revenues decline) and/or don't think that the more conservative British government should decide how Scots run their social welfare program then you should support independence. If you don't support the social welfare changes, or are skeptical of how much it will cost Scotland, then you should not support independence. The Basics: Salmond wants to keep using the British pound, but all of the U.K.'s major political parties oppose a currency union. Kevin Dowd, a professor of finance and economics at Durham University, summarized the pros and cons of Scotland keeping the pound in an op-ed for City A.M., but the key point is that while Scotland can keep using the pound without England's permission, it would also have to accept the Bank of England's monetary policies throughout the British Isles. Also, Scotland's struggling banks would no longer be able to rely on the Bank of England if things get bad. Another, less than ideal option, would be to use the Euro. 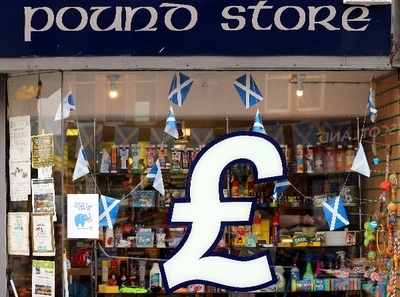 If you, like the Adam Smith Institute, think Scotland could "flourish by using the pound without permission," as The Guardian put it, then you should support independence. If you don't, then you should not support independence. Paradoxically, pro-independence Scots have argued that they will recapture some of the advantages of size by joining the European Union. It seems slightly bonkers for Scots to get so frustrated about ceding power to bureaucrats in London and turn immediately to bureaucrats in Brussels, but there it is." If you prefer bureaucrats in Brussels (or, if joining the EU doesn't work, just in Edinburgh) then you should support independence. 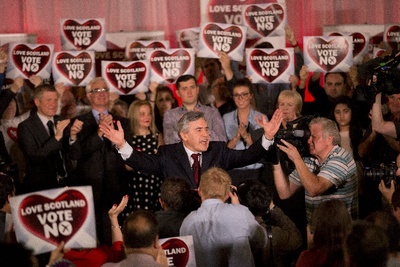 If you prefer bureaucrats in London then you should not support independence. If you think Scotland has an independent history and an independent culture that warrants an independent nation, then you should support independence. If you think Scotland can still be culturally and historically independent without being a different country, then you should not support independence.